Yield 25 - 30 lb. Use Weston 19-0302-W natural hog casings for fresh sausages that will be prepared by skillet cooking, frying, or grilling. Edible and all natural, this casing is still preferred by many professional butchers today for making homemade sausage the traditional way. They should be rinsed with fresh water to rid of salt and then soaked for several hours prior to use. The size of these natural casings, ranging from about 32-35mm in diameter, is great for making bratwurst and Italian sausages! Compared to processed casings, natural hog casings have thinner walls. This thinner build offers a more delicate taste, which helps preserve the natural flavors of the sausage. Great for hunters, butcher shops, and meat departments, this casing is packaged in a convenient zipper seal vacuum bag for maximum freshness and easy storage. It is also packed with salt to maintain quality and help lengthen the life of the product. This casing makes 25-30 lb. of sausage. 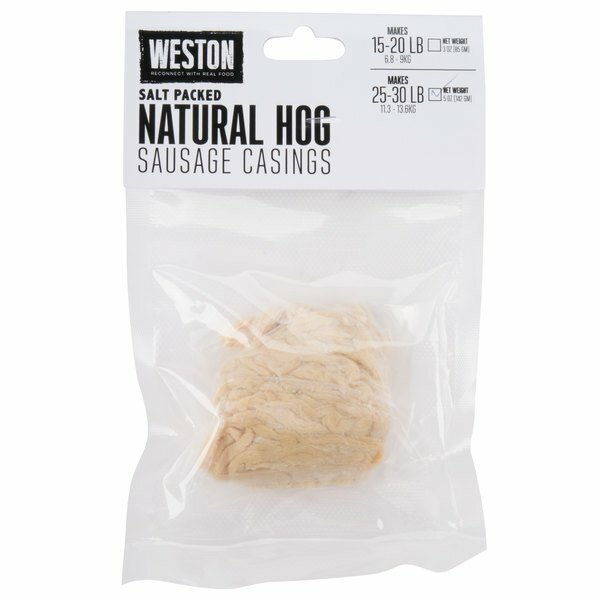 Overall User Rating: Weston 19-0302-W Natural Hog Casings - Makes 25-30 lb. I purchased the Weston 19-0302-W Natural Hog casings that makes 25-30 pounds of fresh sausages. 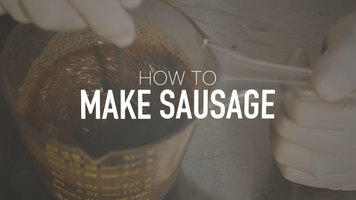 After purchasing the Collagen casing I quickly learned I was using the wrong casing for my homemade chorizo and sausages. After researching I found the product I needed at a great price. Works perfect easy to twist just soak it in cold water for 1 hour before stuffing. these things hold up well these things are cheap but hold up as if they were very expensive this is another great product from the web restaurant! The quality of these casing are pretty poor, the casing have the highest burst rate we have never seen before. The texture is also questionable after cooking and our customers did do not like it. We appreciate your review, Kristin! Our Customer Solutions team has added a store credit to your account for this issue.